Photo taken at the Port Clements Museum. The bird may be viewed for a mere $3. Image | This entry was posted in Haida Gwaii and tagged albino, Common Raven, Corvus corax, Port Clements, raven. Bookmark the permalink. The correct answer is “Common Raven” or “Corvus corax“. It is indeed an albino. It lived in Port Clements until about the age of two when it got jolted by a power line. Street cred awarded to Lea for naming the genus and Joel for knowing the important part of its common name. 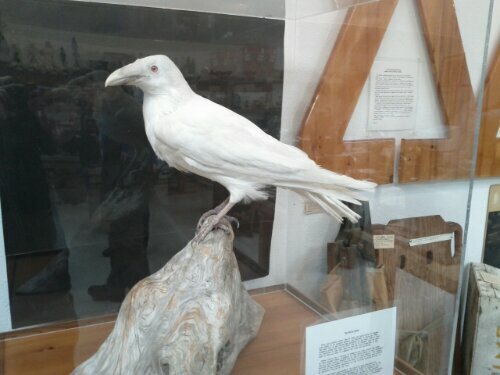 Quoth the albino raven: nevermore.